Well, I was going to start this blog post saying that I can’t believe I didn’t blog yesterday, but I really can! I had such a great day playing with my new club of Croppin’ Cuties in the morning and then scrapping this layout for my THS club in the evening. It was getting late, so I decided to post the right side of the layout since I didn’t have time to finish the title. Unfortunately, my phone and computer weren’t playing nice, so it took me far longer to upload the photo than intended. Needless to say, I wasn’t a happy camper and simply went to bed after posting to the LOAD Flickr group and FB. Luckily, everything went well tonight, so I’m posting both sides of the LO. My THS club is doing the Moonlight WOTG next week. I always struggle with Halloween layouts, because my husband and I turn off the lights and watch a movie…we aren’t big into celebrating this holiday. 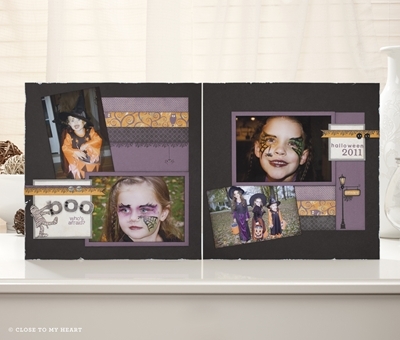 I have one layout about Halloween across the years in my album, and that’s it! My friends find it funny, because I’ve been in a ton of plays and go to Star Trek conventions, so I really am the type of person to dress up. Honestly, I have lots of costume ideas, but I’m far too lazy to execute them! 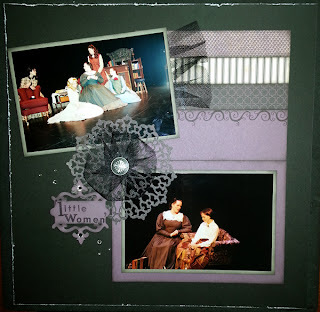 So, I was excited when I saw the LOAD prompt for 10/7, because it started with a quote by Marmee March from “Little Women.” I played that character in Olympia back in 1999! Luckily, I had just enough photos to complete the Moonlight WOTG layout. This is what I uploaded for LOAD #7. I had every intention of including barn red accents, hence the sign, but I ended up changing colors midstream tonight when I finished the title page. Once again, I was simply too lazy to fix it. I’m not too bothered by it since I don’t know that I would have ever scrapped these photos without the prompt inspiration. 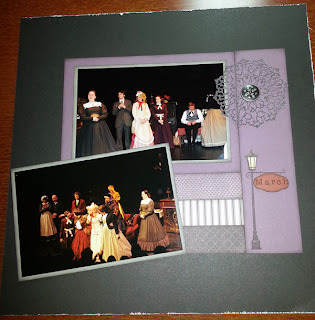 I’m pretty excited about this, though, because I really think I should scrapbook photos from all the plays I’ve been in or directed to add to my “All About Me” album. It will be fun to have a visual theatrical resume! I did change up the 2nd page a bit after finishing the title page. I added tulle, journaling, sparkles, and a little black ink brushed on with the blending pen so the lamp post didn’t look like it was floating in space. So, here’s my question…how do you adhere tulle? This was the first time I worked with it and I did not do an awesome job. Oh well…the layout still makes me happy. In addition to the Moonlight WOTG, I used shapes from Artiste & Art Philosophy, Black Tulle Ribbon, and Pewter Badge Buttons.